WHAT UGANDA SHOULD FOCUS ON AS WE CELEBRATE 2012 WORLD TOURISM DAY 27Th SEPTEMBER 2012? The Rio+20 United Nations Conference on Sustainable Development emphasized that well-designed and well-managed tourism can make a significant contribution to the economic, social and environmental dimensions of sustainable development. One of the world’s largest economic sectors, tourism is especially well-placed to promote environmental sustainability, green growth and our struggle against climate change through its relationship with energy. “Tourism and Sustainable Energy: Powering Sustainable Development” is the theme of this year’s World Tourism Day, selected to advance the goals of the 2012 International Year of Sustainable Energy for All. Hundreds of millions of people around the world depend for income on this energy-intensive sector. Sustainable energy will allow tourism to continue to expand while mitigating its impact on the environment. Many in the tourism industry have already shown leadership in developing and deploying clean energy solutions, cutting energy consumption and carbon emissions in some regions by up to 40 per cent through initiatives such as the Hotel Energy Solutions toolkit developed by the UN World Tourism Organization and the UN Environment Programme. Other concrete advances include the growing use of energy-efficient fuels in air travel, sustainable procurement strategies and increasingly popular carbon offsetting schemes. Everyone has a role in sustainable tourism. I commend the tourism community for its growing commitment to sustainable energy. I also thank the tourists who play their part by off-setting their own carbon emissions, choosing ecologically friendly destinations and providers, or simply by postponing having their towels laundered. Every action counts. This year, one billion international tourists will travel to foreign destinations. Imagine what one act multiplied by one billion can do. On this World Tourism Day, I appeal to all who work in and enjoy the benefits of this global sector to join in building a more sustainable future for all. In August 1972 my friends and I had just returned from a driving holiday in neighbouring Kenya. Cynthia, my girlfriend (and future wife) had a few days earlier left on a holiday to the UK. We were still in a holiday spirit returning from Jinja from a birthday party in Jinja when we caught a snippet on the radio "President Amin has a dream ... Asians are to be expelled from Uganda". We don't think much of it - must be some joke. But as the days passed it slowly sank in. I was working for the Ministry of Finance and Planning as a Statistician. At a young age I was in charge of collecting and publishing Uganda's trade statistics, preparing background to the national Annual Budget; it was a great job and times were good. I was contributing to my country in a way I did not think possible. I was a first class citizen with no complaints. Socially, life was also good. I was the Sports Secretary and Hockey Captain of the Entebbe [formerly "Goan"] Institute. Everything centred around the Club. We were still primarily involved with Goans, but Uganda was integrating. I had studied at an African high school (St Mary's College Kisubi) run by Canadian missionaries, and attended Makerere University there with African colleagues. Africans members constituted 30% of the Entebbe Institute - primarily Civil Servants as Entebbe was the centre of the government. In addition to Goans, we had every kind of members: every tribe of Uganda (Baganda, Basoga, Luo, etc), all types of other Indians (Ismailis, Boras, Gujaratis, Sikhs, etc. ), and others (British, Israelis, ...) Friendship was quickly becoming raceless. Indeed, the newly elected President of the club, Dr Peter Tukei, would have been elected regardless of the Expulsion; he was a very popular person and had previously been Vice-President. Life during the Expulsion turned upside down. Times were tough; but we found joy in small things - we truly lived like there was no tomorrow. 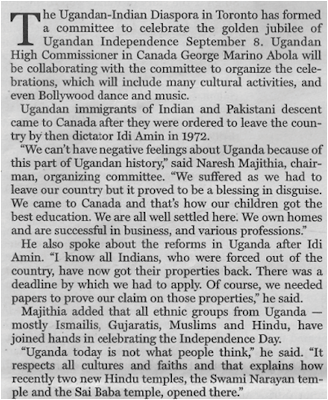 As most of my family members were Uganda citizens, we thought we would be staying. My mother, my aunt and many other, however, would be leaving. (My mum and dad had always thought that they were "too old" to be taking on a new citizenship, not fully realizing then the implications). And for citizens, we still had to go through the process of verifying our citizenship. The Uganda government used every technicality to take away our citizenship. I remember queuing outside the Immigration department, sleeping on the streets for 36 hours with my two brothers and sister, brother-in-law, and thousands of other Asians. My brother Peter was subdued. His Renunciation of British Citizenship had been mishandled by the Uganda government several years ago as he had been one of the first to become Ugandan. He expected trouble, and was right; his citizenship was withdrawn. My sister Ruth lost her citizenship on some pretext. I almost lost mine because I only had a photocopy of my citizenship, and the officer almost tore it up. I pleaded for time to find the original, noticing from the corner of my eye an old classmate from St. Mary’s College as immigration officer two booths down. I rushed over to him: "Hey Katabula, are you there". "Hey Nazareth, throw it over." Stamp! Stamp! My brother David and I were verified. Peter was subsequently exempted from the Expulsion as he held a senior government post, also in the Ministry of Finance. Ruth could stay as her husband Cyril had his citizenship verified, but she had to resign from her job. Given that I had thrown in my lot with Uganda, this was heartbreak. And so it went with everyone. And the deadline approached. If it were not so serious the Expulsion could be funny. President Amin would one day be expelling more and more categories of people, and the next day his ministers would be exempting more and more subcategories, being horrified at the loss to the country. One day it was British Asians, another day all Asians - citizens included. Several Ugandans implored President Amin not to expel citizens. President Nyerere of Tanzania offered to take in any Ugandan citizen who was expelled. President Amin relented and we were allowed to stay. Then in September 1972 the UN came to take stateless people, and Canada to take anybody (ie regardless of citizenship) who wanted to leave and who qualified. All of a sudden there was a new game in town. Everybody was going to leave now. Well almost everybody. My family stubbornly decided to stay put. Meanwhile my Permanent Secretary I.K. Kabanda called me to his office and said "John, I want you to know that not all Africans hate you. We hope and pray that this will soon be all over so that you can lead a normal life. You can come in to work when you wish, and leave when you wish." I will never forget his graciousness (and made it a point to seek him out when I returned to Uganda 21 years later). Young as I was (25 years) I ended up being the Club volunteer barman, together with Claude De Souza. The bar - the centre of stories. Chris Ssengendo was there one night with his cousin visiting from Kampala. His cousin's eyes were red. I inquire with Chris. "Don't ask. He works at the dreaded Makindye Prison. He had orders to spend all of last night executing [political] prisoners with a hammer to the head." We Asians were being expelled, but African Ugandans were being slaughtered. Past the Deadline, a strange calm has descended. 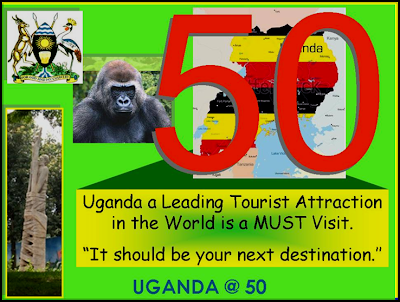 There are still around 5000 Asians left in Uganda who have been exempted or have decided to stay. The Africans have a quiet admiration for those who stay behind in spite of all the harassment. But now is when the killing of African Ugandans starts in earnest. One gets used to seeing bodies by the roadside every day. A friend, Godfrey Kiggala is killed because President Amin likes his girlfriend. In early 1973 my brother Peter left to take up a Fellowship at Yale; my brother David realized he couldn’t live without his girlfriend Lydia and impulsively left to marry her in Canada; sister Ruth left to join my mother (now in London) ahead of Cyril. In September 1973 I left Uganda, taking a two-year of Leave of Absence to do postgraduate studies – hoping that while I was away, Amin would be overthrown. I went through Goa, getting married to Cynthia at St. Jerome’s Church in Mapusa. We then proceeded to the UK where I studied for a year at the London School of Economics and obtained a Post-graduate Diploma in Statistics and then did my Masters in Mathematical Statistics from the University of Toronto. It is now later in 1975 and as my studies at the U of T are at an end I realize that President Amin is there to stay. With a heavy heart I finally send in my letter of resignation to the Ministry of Finance, thanking them for giving me an opportunity to serve my country. A tear rolled down my cheek. 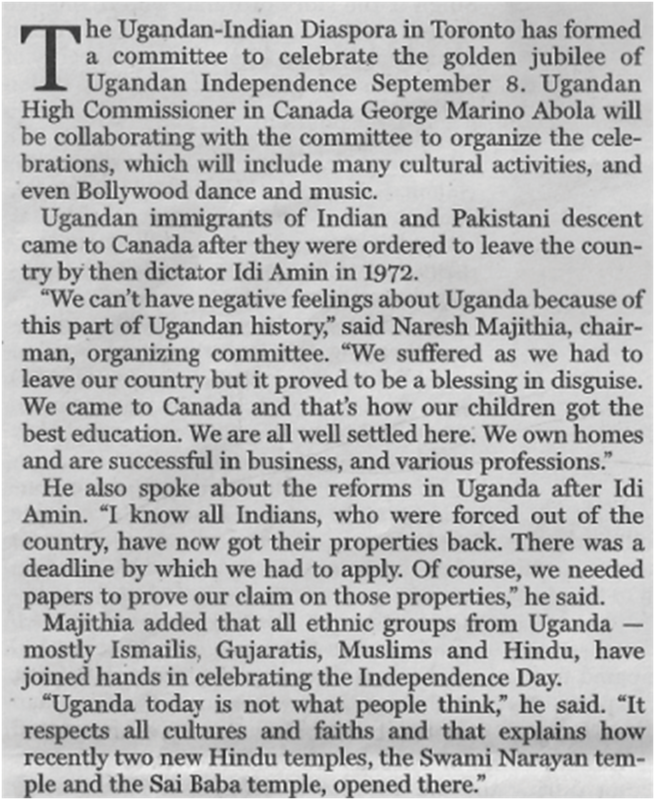 Written by John H. Nazareth in Toronto, 1994 To be published in Val Jamal’s forth-coming book: “Uganda Asians: Then and Now, Here and There, We Contributed, We Contribute”. By John Nazareth in Toronto Canada 1500 - Bito dynasties of Buganda, Bunyoro and Ankole founded by Nilotic-speaking immigrants from present-day southeastern Sudan. 1700 - Buganda begins to expand at the expense of Bunyoro. 1800 - Buganda controls territory bordering Lake Victoria from the Victoria Nile to the Kagera river. 1840s - Muslim traders from the Indian Ocean coast exchange firearms, cloth and beads for the ivory and slaves of Buganda. 1862 - British explorer John Hanning Speke becomes the first European to visit Buganda. 1875 - Bugandan King Mutesa I allows Christian missionaries to enter his realm. British influence 1877 - Members of the British Missionary Society arrive in Buganda. 1879 - Members of the French Roman Catholic White Fathers arrive. 1890 - Britain and Germany sign treaty giving Britain rights to what was to become Uganda. 1892 - Imperial British East Africa Company agent Frederick Lugard extends the company's control to southern Uganda and helps the Protestant missionaries to prevail over their Catholic counterparts in Buganda. 1894 - Uganda becomes a British protectorate. 1900 - Britain signs agreement with Buganda giving it autonomy and turning it into a constitutional monarchy controlled mainly by Protestant chiefs. 1902 - The Eastern province of Uganda transferred to the Kenya. 1904 - Commercial cultivation of cotton begins. 1921 - Uganda given a legislative council, but its first African member not admitted till 1945. 1958 - Uganda given internal self-government. Elections held in 1961 - Benedicto Kiwanuka elected Chief Minister. 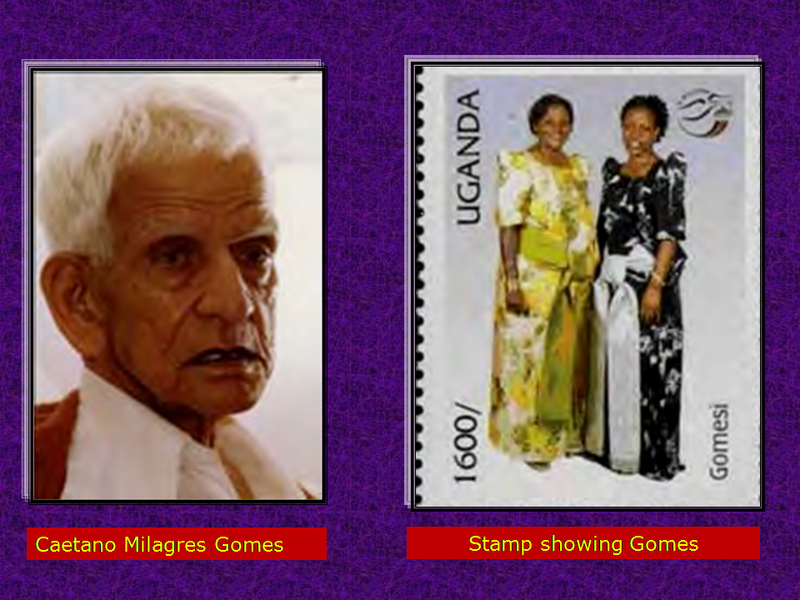 1962 - Uganda becomes independent with Milton Obote as prime minister and with Buganda enjoying considerable autonomy. 1963 - Uganda becomes a republic with Buganda's King Mutesa II as president. 1966 - Milton Obote ends Buganda's autonomy and promotes himself to the presidency. 1967 - New constitution vests considerable power in the president. 1971 - Milton Obote toppled in coup led by Army chief Idi Amin. 1972 – Amin expels Israelis giving them 2 weeks to leave. 1972 - Amin orders Asians who were not Ugandan citizens - around 60,000 people - to leave the country in 3 months. 1972-73 - Uganda engages in border clashes with Tanzania. 1976 - Idi Amin declares himself President of Uganda for life and claims parts of Kenya. 1978 - Uganda invades Tanzania with a view to annexing Kagera region. 1979 - Tanzania invades Uganda, unifying the various anti-Amin forces under the Uganda National Liberation Front and forcing Amin to flee the country; Yusufu Lule installed as president, but is quickly replaced by Godfrey Binaisa. 1980 - Binaisa overthrown by the army. 1980 - Milton Obote becomes President after elections. 1981-86 Following the bitterly disputed elections, Ugandan bush war fought by National Resistance Army 1985 - Obote deposed in military coup and is replaced by Tito Okello. 1986 - National Resistance Army rebels take Kampala and install Yoweri Museveni as President. 1993 - Museveni restores the traditional kings, including the king of Buganda, but without political power. 1995 - New constitution legalizes political parties but maintains the ban on political activity. 1996 - Museveni returned to office in Uganda's first direct presidential election. 2000 - Ugandans vote to reject multi-party politics in favour of continuing Museveni's "no-party" system. 2001 January - East African Community (EAC) re-inaugurated in Arusha, Tanzania, laying groundwork for common East African passport, flag, economic and monetary integration. Members are Tanzania, Uganda and Kenya. 2001 March - Museveni wins another term in office, beating his rival Kizza Besigye by 69% to 28%. Campaign against rebels 2002 October - Army evacuates more than 400,000 civilians caught up in fight against cult-like LRA which continues its brutal attacks on villages. 2003 May - Uganda pulls out last of its troops from eastern DR Congo. Tens of thousands of DR Congo civilians seek asylum in Uganda. 2004 December - Government and LRA rebels hold their first face-to-face talks, but there is no breakthrough in ending the insurgency. 2005 July - Parliament approves a constitutional amendment which scraps Presidential term limits. Voters in a referendum overwhelmingly back a return to multi-party politics. 2005 October - International Criminal Court issues arrest warrants for five LRA commanders, including leader Joseph Kony. 2006 February - President Museveni wins multi-party elections, taking 59% of the vote against the 37% share of his rival, Kizza Besigye. 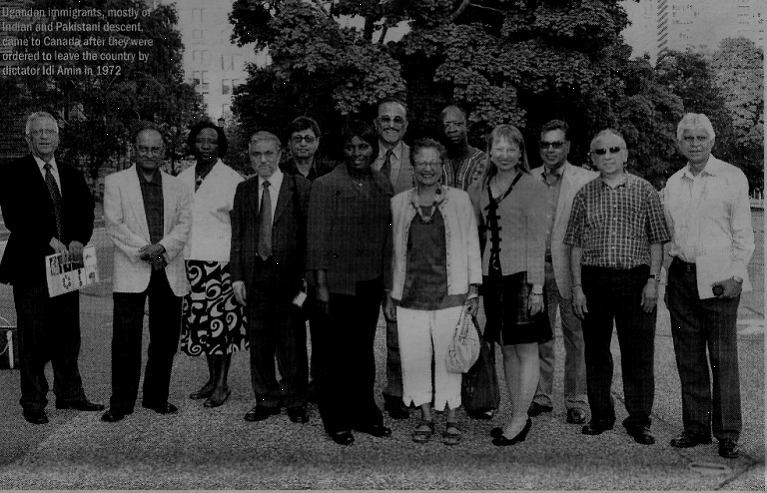 2006 August - The government and the LRA sign a truce aimed at ending their long-running conflict. Subsequent peace talks are marred by regular walk-outs. 2007 March - Ugandan peacekeepers deploy in Somalia as part of an African Union mission to help stabilise the country. 2008 February - Government and the Lord's Resistance Army sign what is meant to be a permanent ceasefire at talks in Juba, Sudan. 2008 November - The leader of the Lord's Resistance Army, Joseph Kony, again fails to turn up for the signing of a peace agreement. Ugandan, South Sudanese and DR Congo armies launch offensive against LRA bases. 2009 The UK oil explorer Heritage Oil says it has made a major oil find in Uganda. 2009 March - Ugandan army begins to withdraw from DR Congo, where it had pursued Lord's Resistance Army rebels. 2009 December - Parliament votes to ban female circumcision. Anyone convicted of the practice will face 10 years in jail or a life sentence if a victim dies. 2010 January - President Museveni distances himself from the anti-homosexuality Bill, saying the ruling party MP who proposed the bill did so as an individual. 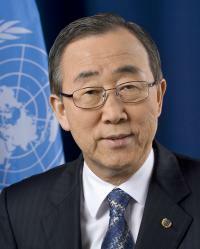 The European Union and United States had condemned the bill. 2010 July - Two bomb attacks on people watching World Cup final at a restaurant and a rugby club in Kampala kill at least 74 people. The Somali Islamist group Al-Shabab says it was behind the blasts. 2011 February - Museveni wins his fourth Presidential election. 2011 July - US deploys special forces personnel to help Uganda combat LRA rebels. 2012 Aug – Uganda’s Stephen Kiprotich win’s the Gold Medal in Marathon at the Olympics – Uganda’s second Gold medal ever, and third Olympic medal since joining the Olympics. By the Nazareth’s Mukasa was born between 1869 and 1871. He was the second son of Zachary Kiwanuka Makabugo Ntambi Ssensalire who was one of King Mwanga II's Chiefs. Hamu was taken to the Kings Palace as a Page Boy. He one day bumped into an Englishman who asked him whether he knew how to read and write and Hamu replied to him that he never learnt but he was being taught Swahili and Arabic in order to read the Koran. This white missionary called Rosco then took Hamu to Alexander Mackay at Natete who taught him how to read and write in English. 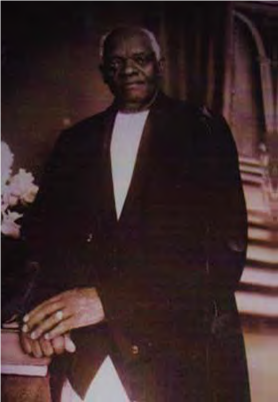 Hamu Mukasa was one of the Page Boys who were persecuted by King Mwanga II. Fortunately, when Mwanga's murdering squad came to pick him up to be taken to Namugongo, Hamu Mukasa had gone to Bulemezi County. Hamu Mukasa's father promised Mwanga's soldiers that when he comes back from Bulemezi he would take him to King Mwanga II. When they went to King Mwanga II Hamu Mukasa was asked whether he was studying Christianity and he replied that he was studying how to read and write by Alexander Mackay at Natete. King Mwanga could not believe how strong hearted the Christians were because Hamu Mukasa in spite of hearing that all his friends were burnt to death he still believed in Christianity. King Mwanga then forgave him because he was brave enough to report back on his return from Bulemezi and never went into hiding himself. It is believed that at this time Mwanga's killing instinct had gone down and probably he was lamenting about the atrocities he had committed. Hamu did very well in these two languages Arabic and English and very soon Sir Apolo Kagwa the Katikiro of Buganda made him his Private Secretary. In 1901 The Katikiro of Buganda was invited to go to Britain to attend the Coronation Ceremony of King George the VI in London. So Hamu Mukasa accompanied the Katikiro to U.K. as his Private Secretary. Their stay in U.K. was prolonged because the coronation did not take place as planned due to the illness of the King. The British Government then decided to make a program of the invited guests to stay in U.K. until the King of England recovered from his illness. This overstaying in England gave the Katikiro and Hamu Mukasa a big opportunity to visit many places in U.K. including Schools, Industries and many other places of Interest. It really exposed them to the British Culture which they adopted. On their return to Uganda these two people decided to build similar institutions in Uganda as those they saw in U.K. This was the beginning of Gayaza High School for the Girls in 1905 and Kings College Budo for boys in 1906. They started building other Institutions like Churches and Hospitals in different places in the country with the assistance of the Church Missionary Society in U.K. They were very influential in the building of Mengo Hospital, Namirembe Cathedral, Bishop Tucker College Mukono, which is now the Uganda Christian University. They started growing cash crops and encouraged many farmers to grow things like cotton, Rice and Rubber trees and they encouraged many foreign investors like Mehta and Madhvani who started Sugar cane growing for the production of sugar. Hamu Mukasa fought a number of wars in the country and the biggest war he fought was the Christian war against the Moslems whereby Hamu Mukasa was the Leader of the delegation which went to Tanzania to bring back King Mwanga II to the throne because he was sent into exile in Tanzania. As they were arriving at Munyonyo from Tanzania with King Mwanga Hamu was shot in his leg and arm and he nearly died. He survived but remained a lame man until he died in 1956. Hamu combined a number of disciplines. He was a devoted Christian and among all the Chiefs in Uganda Hamu is known to have been the only Chief who had only one wife and married in Church. His first wife died in 1919 after 25 years of marriage and he married his second wife in the same year and they lived together until he died in 1956. He had 14 Children five boys and nine girls and only two are still alive, namely Ida Jessie Mukasa and George Kasede Mukasa. Hamu Mukasa was also a very successful businessman. He grew Rice and Rubber Trees in Kyagwe where he was the county Chief of Kyagwe county for 28 years. During his period as the Chief of Kyagwe that county became the richest county in the country with big Sugar Plantations, Tea, Coffee and Rubber. His contribution to the development of Education, Agriculture and Commerce was very great and he is one of the biggest achievers in the fifty years of our Independence as Uganda is still enjoying his fruits. Another advantage Hamu Mukasa had was that he officially visited U.K. twice. In 1911 he accompanied Sir Daudi Chwa II the Kabaka of Buganda when the Kabaka was officially invited by the British Government. The British Government had a system of inviting Traditional Rulers in their colonies to visit Britain in the hope that they would be exposed to the European civilization. This second visit to U.K. made Hamu Mukasa extremely exceptional among his fellow Chiefs who had never travelled abroad. IS IT POSSIBLE THAT NRM IS BENEFICIARY OF GHOST MONIES?